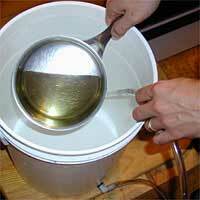 For a five gallon batch, 3/4 cup of corn sugar is used to prime the beer for bottle conditioning. 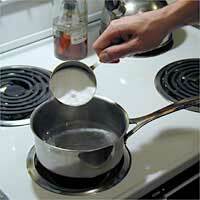 Add the sugar to a small sauce pan with two cups of water. Boil the sugar for 15 minutes to disolve and sterilize. The priming sugar is added during the bottling process because it will supply the yeast with more sugar to metabolize while the yeast lives in the bottle. The result is carbonated beer! The sugar must be a small measured quantity because too much sugar could over-carbonate the beer and cause exploding bottles. At this point while the sugar boils, set up the sanitized bottling bucket. 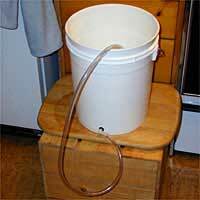 Your bottling bucket may have a spigot instead of the tube pictured to the left. 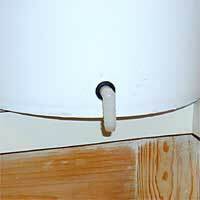 If your bucket has a spigot, make sure it is closed. The bucket pictured to the left has a homemade spigot which requires a piece of tubing to be attached in order to prevent draining (a little crude but it works). Attach a length of tubing to the spigot, and insert the bottle filler in the open end of the tubing to complete the circuit. A bottle filler is highly recommended for the bottling process, and it costs just a few dollars for a plastic one. It should also be sanitized. In order to preven the filler from touching any contaminating surfaces before filling the bottles, I insert the end in the bottling bucket until filling time. When the bottling bucket is ready, pour the boiled priming sugar into the bottling bucket where the beer will be siphoned on top of it.